Adrian Sameli is blogging about his inspiring journey around the world. 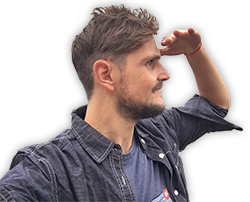 He is an avid traveller and started this solo travel blog in 2015 as part of a sabbatical gap year. Since then, he has become a digital nomad and did pro bono consulting for impact-driven social enterprises in America, Africa and India. Follow his epic trips, read his catchy stories and become part of this unique journey. Learn how to travel more mindfully, meet strangers, embrace foreign cultures and become an inspiring person yourself. The journey starts with you!